Flowers fascinated Georgia and they were her favorite subject on canvas. She seems to have liked particular flowers - the calla lily, poppy, canna, iris, petunia, and jimson weed. O'Keeffe painted Oriental Poppies in 1928. This stunning work was declared a groundbreaking, art masterpiece. 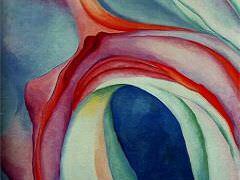 O'Keeffe was very much drawn to the abstract - and abstracting aspects of the flowers. She explores the elements of colour, shape and texture of the objects she paints. Which of these is most dominant seems to depend on the individual flower. 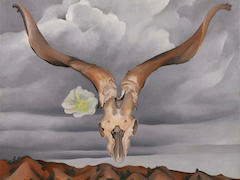 She was preoccupied with simple forms from the very beginning and her earliest flower paintings. Colour is often bold, frequently carefully modulated but tends to come across as somewhat 'flat'. 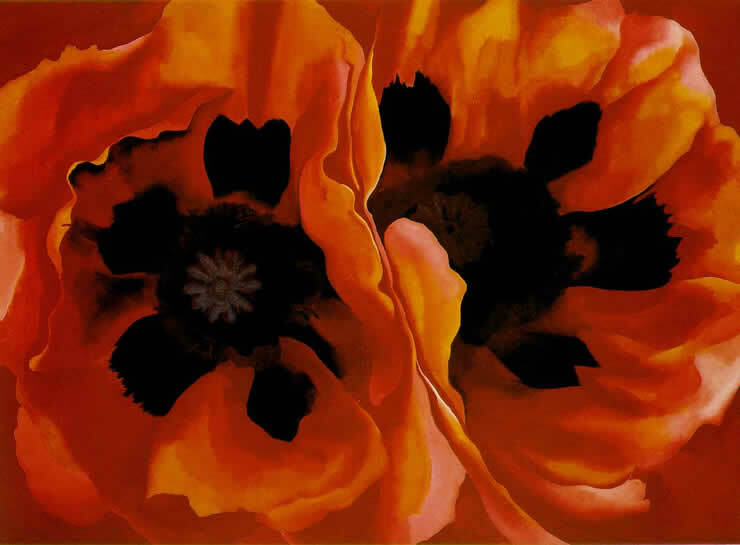 In "Oriental Poppies," O'Keeffe depicts two giant poppy flowers. 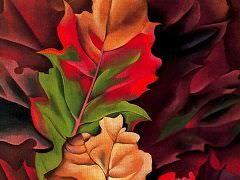 Measuring 30" x 40", this oil painting is an explosion of brilliant colors on a vast canvas, lending a mesmerizing effect. 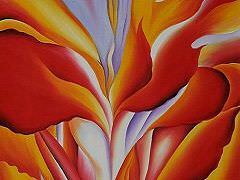 O'Keefe used dazzling red and orange as the main color of the petals. The hollowed centre and the inner contours of the flowers are painted in deep purple. The skillful shading and velvety finish of the petals accentuates the vibrancy of the flowers. "Oriental Poppies" almost looks like a close up photograph. 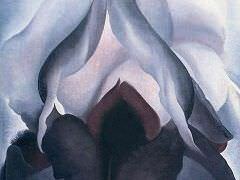 O'Keeffe did not give any background to the painting, to artfully draw focus onto the flowers. The absence of context in the painting presents them in a new light as pure abstracts. "Oriental Poppies" exudes a startling pull, as if casting a hypnotic spell on the viewer. 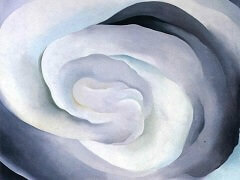 Georgia O'Keeffe's ability to capture beauty that often went unobserved led to her receipt of the Presidential Medal of Freedom and the National Medal of Arts as well as election to the American Academy of Arts and Letter. Oriental Poppies is now a part of a collection at the University of Minnesota Art Museum, Minneapolis. Copyright © 2011-Present www.GeorgiaOkeeffe.net. All Rights Reserved.